Concerned vehicles may suffer from frame corrosion issues, which could result in spare tires becoming loose. Toyota has announced it is recalling certain model-year 2001 to 2004 Toyota Tacoma pickup trucks due to a corrosion problem. Affected models may contain a spare tire carrier that has not been properly coated with phosphate, which may lead to corrosion on certain vehicles. Consequently, excessive rust may cause the lift plate to break and result in spare tire detachment. All 2001 to 2004 Tacoma vehicles contain a spare tire carrier on a metal lift gate located underneath the rear bed. The recall involves a total of 150,000 pickups. The recall concerns Tacoma vehicles originally sold or presently registered in 20 cold climate states and the District of Columbia. The 20 cold weather states are: Connecticut, Delaware, Illinois, Indiana, Kentucky, Maine, Maryland, Massachusetts, Michigan, Minnesota, New Hampshire, New Jersey, New York, Ohio, Pennsylvania, Rhode Island, Virginia, Vermont, Wisconsin and West Virginia. Toyota will begin notifying owners of the safety recall beginning in December 2012. Authorized Toyota dealers will perform this recall, free of charge to vehicle owners. In some cases, the entire spare tire carrier will be replaced. Tacoma owners can contact the Toyota Customer Experience Center at 1-800-331-4331 or visit www.toyota.com/recall. Concerned customers may also contact the National Highway Traffic Safety Administration’s Vehicle Safety Hotline at 1-888-327-4236. Toyota issued an identical rust recall in 2009 when it recalled 110,000 Toyota Tundra trucks. The recall covered model-year 2000 to 2003 vehicles, all of which suffered from frame corrosion. Like Wednesday’s recall, the Tundra recall concerned Tundras located in cold weather states. The automaker recalled roughly 778,000 Toyota and Lexus vehicles in the U.S. for a rust problem in August. The recall included 760,000 model-year 2006 to 2011 Toyota RAV4 SUVs and 18,000 model-year 2010 Lexus 250h hybrid sedans. Toyota also recalled an additional 99,000 RAV4s and 1,000 Lexus HS 250h vehicles in Canada for the same problem. Aside from rust issues, the Toyota Tacoma has also been susceptible to airbag problems. In March, the automaker recalled about 495,000 Tacoma pickups due to a steering-wheel assembly issue that may lead to airbag deployment failure. The recall covered model-year 2005 to 2009 vehicles, and specifically concerned steering-wheel spiral cable design. Released in 1995, the Toyota Tacoma is an award-winning mid-size pickup truck, currently in its second-generation. It was originally designed as compact pickup, but was redesigned in 2005. 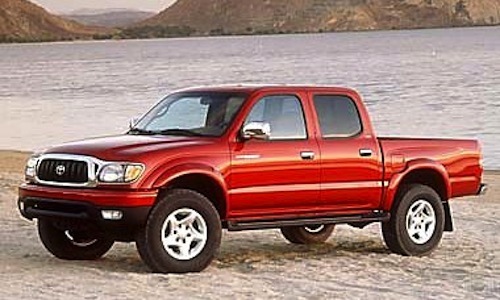 The Tacoma earned Motor Trend magazine’s "Truck of the Year" award for 2005. The Tacoma has been the best-selling compact pickup since 2005. Sadly, I went to the local Toyota dealership and they turned me away Because Im Military, and out of state, But im serving in a state thats on the recall listing, So they appeased me and looked at it. but still turned me away because I didnt met the minimum requirement of the recall for the "amount of rust damage." Although they did state that my VIN is on the recall list. Shame toyota. Shame.